London, March 27: The highlight lot, a silver-mounted 20-bore flintlock gun and bayonet from the personal armoury of the last ruler of Mysore, proved hugely popular as it attracted 14 bids before going under the hammer for 60,000 pounds. A collection of rare artefacts from Tipu Sultan’s armoury, including one of his personal swords, discovered by a couple in their attic in the English county of Berkshire has been auctioned for around 107,000 pounds. 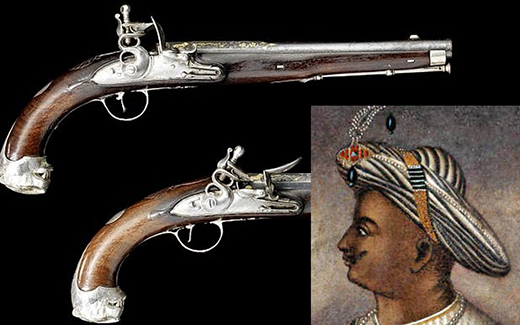 “Unlike other Tipu Sultan guns this one exhibits clear signs of having been badly damaged in its past…rather than being taken directly from the rack after the fall of Seringapatam it appears to have been collected from the battlefield,” the lot description notes. The two centrepieces formed part of a collection of eight items brought back by Major Thomas Hart of the East India Company after the Tiger of Mysore’s defeat at Seringapatam in 1799. Tipu died in 1799 at the age of 48.